Vaughan's school held an afternoon ANZAC service yesterday. 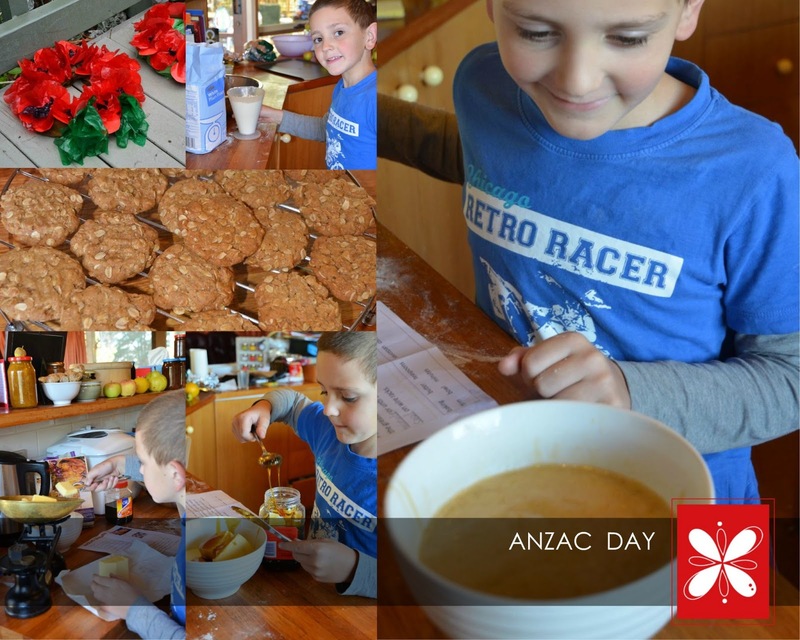 As part of the day's preparations, the students made ANZAC biscuits, which were offered for afternoon tea - and sample packs sent home to share with family. Vaughan and I made more ANZAC biscuits (aka ANZACies) today. There was maths involved as we doubled the recipe he had carefully written out at school. There was science also, when the bicarb soda was added to the water - and then to the melted butter/golden syrup mix. We made 49 biscuits in total. Vaughan insisted that the chookies be given a taste-test, so they shared the first one! Of course there were plenty of biscuits left - enough to send a large jar with Nick, for sharing with work colleagues also on shift during the public holiday. The remaining "ANZACies" are still on the bench, proving quite a temptation. I doubt there will be any more for the girls!